PERFORMANCE while meeting—and even anticipating— new regulations and emissions standards. That's exciting for shops because it means they will have a growing inventory of high- demand parts available to sell. New technology is affecting the Truck Performance market for aftermarket shops by … … making it possible to offer parts and systems that meet ever-increasing state and federal emissions standards while giving customers the added performance and reli- ability they're looking for. Also, technology is making it easier than ever for shops to reach customers with tools like social media, email mar- keting, website design and optimization, mobile marketing and more. A great tip for shops to increase Truck Performance sales is … … to find and do business with reliable partners that have a track record of forward momentum, innovation and success. By partnering with companies they can depend on for service and reliability, even the small- est shop can leverage the talents, skills and assets of leading businesses. For example, working with Sinister Diesel allows our dealers and shops to offer their customers the best-performing parts while giving those shops access to one of our dedicated account managers, live technical support and more. 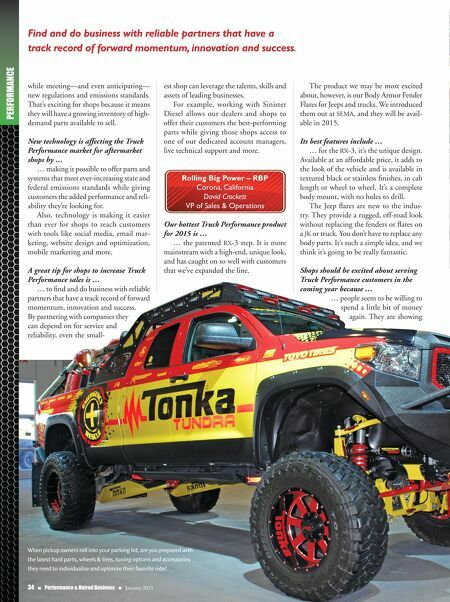 Rolling Big Power – RBP Corona, California David Crockett VP of Sales & Operations Our hottest Truck Performance product for 2015 is … … the patented RX-3 step. It is more mainstream with a high-end, unique look, and has caught on so well with customers that we've expanded the line. The product we may be most excited about, however, is our Body Armor Fender Flares for Jeeps and trucks. 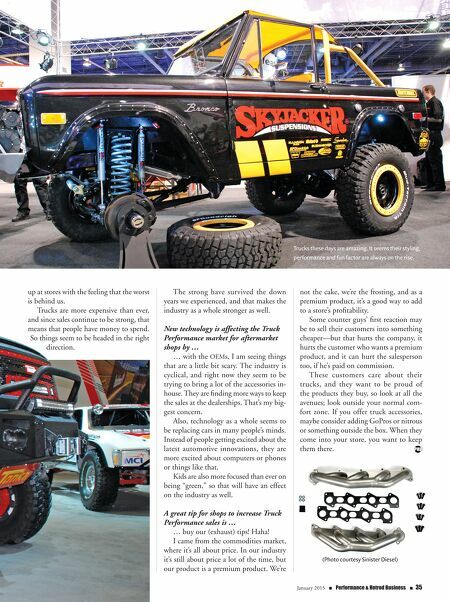 We introduced them out at SEMA, and they will be avail- able in 2015. Its best features include … … for the RX-3, it's the unique design. Available at an affordable price, it adds to the look of the vehicle and is available in textured black or stainless finishes, in cab length or wheel to wheel. It's a complete body mount, with no holes to drill. The Jeep flares are new to the indus- try. They provide a rugged, off-road look without replacing the fenders or flares on a JK or truck. You don't have to replace any body parts. It's such a simple idea, and we think it's going to be really fantastic. Shops should be excited about serving Truck Performance customers in the coming year because … … people seem to be willing to spend a little bit of money again. They are showing When pickup owners roll into your parking lot, are you prepared with the latest hard parts, wheels & tires, tuning options and accessories they need to individualize and optimize their favorite ride? 34 n Performance & Hotrod Business n January 2015 Find and do business with reliable partners that have a track record of forward momentum, innovation and success.